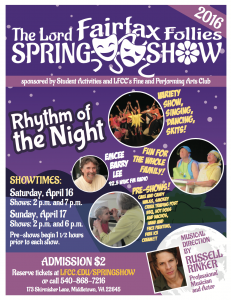 Lord Fairfax Community College will hold its 35th Spring Show with performances on Saturday, April 16, and Sunday, April 17 at the College’s Middletown Campus. There are two performances in the McCoy Theatre on both days: 4/16 at 2:00 p.m. and 7:00 p.m., and 4/17 at 2:00 p.m. and 6:00 p.m. The show includes music, dance, and skits by performers of all ages. This year’s theme is “Rhythm of the Night” which includes a medley of songs relating to dreams, stars and moons that will make you smile, reminisce and tap your feet. Russell Rinker is Musical Director and Barry Lee from WINC Radio serves as emcee. Ticket prices are $2 each, and include a pre-performance event in the Corron Community Development Building. The pre-performance event offers free ice cream, a cake/candy walk, face painting, live music and food for purchase. LFCC Student Activities and the Fine and Performing Arts Club sponsor this annual variety show. To reserve tickets, visit www.lfcc.edu/springshow or contact the Student Activities Office at (540) 868-7216.